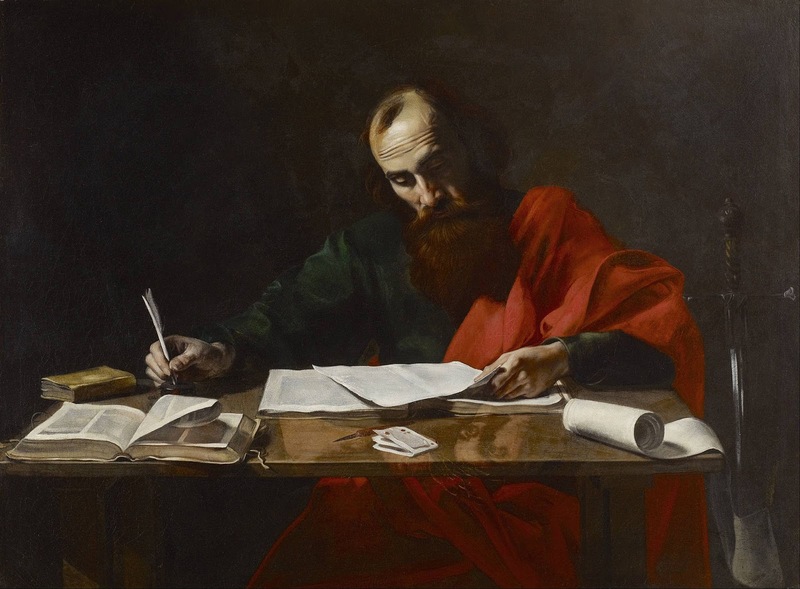 Paul Writing His Epistles attr. Valentin de Boulogne (17th century). Paul had a thing or two to say about salvation. a few notes on his contribution to the discussion. the understanding of a reciprocal or covenant relationship between two parties. with reciprocity in the form of making and keeping covenants” (p. 15). reciprocal between parties in ancient Greek thought. patron-client system common throughout the Roman world of the first century (p.
teach that grace is a one-way, one-time, permanent gift from Christ to mankind. vertically bind man to God through obligations to keep his commandments” (p.
are well-reasoned, enlightening, and welcomed. the ancient Greek understanding. Schmidt insists that the Book of Mormon’s “ideas of grace . . .
are more at home in the worlds of the Bible and the ancient Mediterranean” than the modern Protestant world (p.
embraced by his love and outstretched arms” (p. 149). 10 and 25, respectively. His argument is worth reproducing here in full. can operate through the grace of God only after one is reconciled unto God. is likewise significant in situating Nephi’s concept of grace in an ancient setting. naturalistic critics of the Book of Mormon have insisted, but are authentic to an ancient Israelite worldview. recommit to living their covenants, so that God’s charis might save them. Young, Journal of Discourses, 14:226–227. Christian Apostasy, ed. Noel B. Reynolds (Provo, UT: FARMS, 2005), 180–81. post-biblical Jewish literature and their respective relationships to charis at pp. 41–49. Thanks for the nice review. I'm glad the information in my work was helpful. Do Mormons believe the above quote to accurately reflect their view of the Bible? Based on my previous discussions with Mormons, anytime the JoDs are quoted, the typical Mormon knee jerk reaction is to say "well, that's just Brigham Young's opinion and not doctrine." So, I ask you here, whether or not this is "doctrine" . . . would you say the quote is true (along the same lines as asking a prospective "investigator" if they believe the book of Mormon is true. Does the quote above "ring true"? Is it something you can get behind and say "Yes! I believe this to be true!"? If so, then why do Mormons still use the KJV when so many words within it's pages are NOT translated correctly? Surely the LDS Church has the resources to produce a better translation than the KJV! Heh, even Joseph Smith Jr. said the German version (forgive me I don't recall exactly which German version) was the most accurate translation. I have a couple of sources (links) that I hope you have time to read (in order to give you some context as to where I'm coming from). The first is http://lds.net/forums/topic/9595-most-correct-bible/ where the discussion talks about Joseph Smith's view of the German Bible. Do you know which German Bible JS was referring to? Could it be used as a "guide" of sorts in translating from the original Hebrew and Greek Texts in order to produce a more complete and accurate translation? Another source would be: https://bycommonconsent.com/2007/11/22/peter-jacob-and-john/ where they discuss the problem with the names Jacob and James. Joseph Smith (I gathered from the article) was pretty keen on using certain names which I can only assume had to do with your Temple rituals and perhaps exaltation. I can only speculate as I've never been through any LDS ceremonies (involving the Temple). I have been inside a Temple prior to it's dedication (OKC). However, this quote from the bycommonconsent link above makes me wonder if the names really are important and not just something to quibble over. Joseph’s theology at this time made a great deal of using certain names, and obtaining particular priesthood keys. He’s not merely making a linguistic quibble here, but making what for him was an important theological point." It seems to me that if names are important, we ought to get them right and not merely lean back on our laurels and claim it doesn't matter as long as everyone knows who we are talking about. If the Bible translators used the original names in some places but not others, then doesn't that indicate the KJV (among others) is not the "word of God" since these versions have NOT been translated correctly? As it pertains to this article and "grace" I'm wondering if you were familiar with the view that Joseph Smith used the phrase "after all we can do" to mean in spite of all we do? I don't recall the exact LDS article I gleaned this from, but the gist was in spite of all our good (or bad) deeds, it all comes down to God's grace. For it is by grace we are saved, and that not of ourselves, not of works, not because God is obligated to save us. Even while we were still sinners, Christ died for us. Christ died for those who were under no obligation to follow Him. But He did it anyway. Grace, unmerited grace is truly a gift from God. However, it doesn't stop there. No, we (who receive and accept His grace) are changed, born again, and His Spirit dwells within us. We have a new nature. So, it is no surprise that those who have been changed will gladly (happily and enthusiastically) follow and obey His commands. Jesus said: "If you love Me, keep My commandments." How can we do otherwise?